Costumes, costumes, costumes, and more costumes...one of the most popular attractions of Dragon*Con, taking place now in downtown Atlanta, is the opportunity to score photos with some of one's favorite sci-fi, fantasy, television, and other celebrities (or extremely close approximations by a number of conventioneers) from popular culture, and a few subcultures. Other photo ops include photographs with the likes of Kate Mulgrew, Tricia Helfer, and Sam Witwer, from Star Trek: Voyager, Battlestar Galactica, and Being Human, respectively. 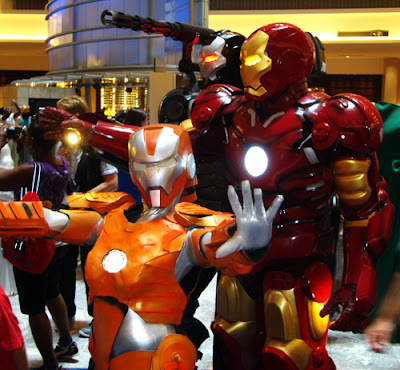 The 25th Annual Dragon*Con is taking place now in downtown Atlanta through Labor Day, Monday, September 5, 2011. ATLANTApix: Is That Dome Real Gold?